Well lookie here! 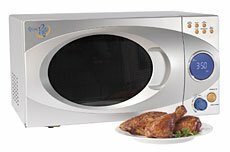 Now there is a Rachael Ray microwave to be added to my list of things I feel driven to buy merely because they have Rachael Ray's name on them. My kitchen has a built-in microwave, so I think I am safe on this one. However, it is affordably priced and has a pretty cool design. If you have the food processor it will match the microwave! "Brown and sear meats, fry eggs and more right in your microwave! Inspired by the microwave on the set of Rachael's television show, this 900-watt microwave oven features a unique grilling/browning function you can use alone or in combination with the microwave. Seven cook settings ensure "just right" cooking times so every dish is completely "yum-o!" Also features Auto Cook, Defrost and Reheat functions, 10 power levels and a glass turntable. Interior measures 13"L x 8"W x 13"H. Silver exterior with orange and blue accents measures 20"L x 14"W x 11-1/4"H.
It's available at www.shoprachaelray.com. Thank God I already have a microwave. Phew. There's also a Blender, a Blender with a Chopper, a more basic Microwave, and a Panini Maker, all listed at the Salton website under a special Rachael Ray Section. The panini maker is pretty funny to me because she is always saying you don't need one and can just use a foil-covered brick to do the same thing. My Foreman makes a pretty good panini too. Santa Claus brought me the Rachael Ray knife. I feel the spirit of RR surround me when I chop with it. I have the old Wustof version, not the Furi one. Darnnit! does anyone know the brand of the microwave she uses on 30 Minute Meals? I want to know the name of the microwave she has on her show as well. Anyone have a clue? I would rather have an oven instead of a microwave.